With the help of Abobe Photoshop you can turn your usual image to an interested photo artwork. In this post we present a couple of recent useful photo effect Photoshop tutorials that may help you improve your skills and enhance the quality of your artworks. We often talk about what an incredible tool Photoshop is to create imaginary scenes from stock photography. 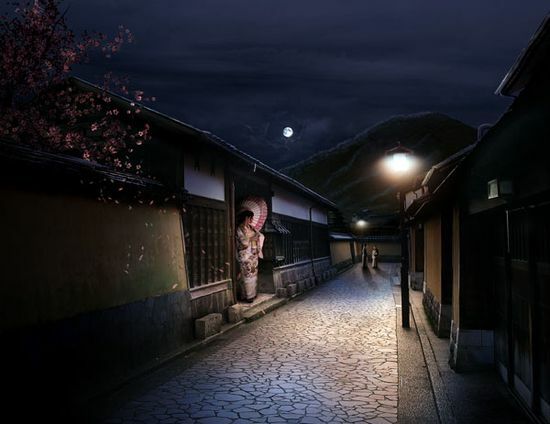 In this tutorial, artist will create a sleepy Japanese village in Photoshop by combining several stock photos. In this tutorial artist will show you how to create “A Life Of Aquatic Sounds”. They realize it using a variety of blending mode tricks, photo filters and other useful Photoshop techniques. Photoshop is great because it allows us to combine several images into a scene that can’t always be created in real life. In this tutorial artist will demonstrate how to combine several stock images into one gloomy scene. So in this tutorial artist will show you a nice technique to create a simple money style illustration using a regular photo, it’s not as perfect as the money illustrations we see in the dollar bill for example, but it’s a quick tip. So in this tutorial, or a quick-tips artist will show you how to create a curtain made of bricks or how to deform a brick wall as it was a curtain. To do that artist will use a few stock photos, layer adjustments and the Displace filter in Photoshop CS5. Sometimes certain scenes are too expensive, dangerous, or even impossible to photograph. This is when people often turn to Photoshop. In only a little bit of time, you can create a very realistic looking image. In this tutorial artist will create an eerie underwater scene. Photoshop is an excellent tool to combine several photos into one seamless image. In this tutorial artist will use different tools and techniques to create an abandoned automobile in a moonlit night scene in Photoshop. We can all imagine what a dark and rainy crime scene looks like. We have all scene them in television and movies. In this tutorial artist will show you how to use different tools and techniques to create a scene of our own in Photoshop. In this tutorial artist will be creating a Surreal Atmospheric Image from these 2 source images. In this tutorial artist will show you how to distort paint splatters using the polar coordinates tool, and then blend various images together using masking techniques and adjustment layers. In this tutorial artist will show you about panoramas and the very basics in levels adjustments to make our images pop in ways they maybe never have! In this tutorial, artist will show you how you can Create Beautiful Surreal Photo Effect via Cloud, Star and Vexel Hair in Photoshop. Photoshop CS5 includes several new features to help improve your workflow. In this tutorial artist will demonstrate how to create a cosmic love goddess using some of Photoshop CS5’s new tools including the Refine Edge Feature which really helps to streamline the process of masking and removing objects from their background. In this tutorial, artist will show you how to use a series of images to make a beautiful, sunset over a hill. We will also add an old abandoned boat to increase the atmosphere. Photoshop CS5’s new Puppet Warp feature can be extremely useful if you need to make minor adjustments to your photos. In this tutorial artist will demonstrate how to correct a Photo with this new tool in minutes. The Warp feature in Photoshop can be a powerful tool if you know how to use it correctly. In this tutorial artist will demonstrate how to combine a few stock images to create a magical flaming heart illustration. In this case artist will choose to remove a person from a photo,with the help of new features called Content Aware this can be done in less than five minutes. With the additional image enhancements this tutorial will take you less than 10 minutes to complete. When you create a print advertisement, it’s important that all the elements of your composition are geared towards selling a product and promoting a brand. In this tutorial artist will demonstrate how to create a refreshing beer-themed poster design in Photoshop. In this tutorial artist will show you some powerful features of brushes. Start with a musical note shape to create a custom brush and deal with some options like shape dynamics and scattering. In this tutorial artist will demonstrate how to use fashion photography and various techniques to create a cosmic-inspired scene in Adobe Photoshop CS5. In this tutorial artist will demonstrate how to create an action and apply it to several images using Photoshop’s batch process function. There are several ways to smooth skin in Photoshop. All to often, however, skin can appear too smooth, fake, and synthetic. In this tutorial artist will demonstrate a straightforward technique to help you smooth skin fairly quickly while preserving the texture of the pores. This tutorial shows the creation of one of my images. It shows how I adjust lighting and colours in my images to create this surrealistic turtle. In this tutorial artist will show you how to create a building hit by a meteorite. artist will show you how to create a realistic smoke trail and a meteorite using only Photoshop filters and custom brushes. In this tutorial, artist will show you how to use layer masking along with the burn tool, brush tool, pen tool, and various others to recreate a face to match a skull. In this tutorial, artist will show you how to simulate an x-ray image in Photoshop. In this tutorial, artist will show you how to have some fun with vectors, custom brushes, and stock images to create a colorful and eye-catching nature themed girl composition in Photoshop. In this Photoshop tutorial artist will show you how to create nice unique photo effect from sketch and your photo. artist will use many tools in Photoshop and also you will need some skills in drawing as to create this effect you will need to draw sketch. In this Photoshop tutorial, artist would like to tell how to make a beautiful mystery grunge artwork, using some stock images and brushes. In this tutorial artist will going to show you how to create Halloween illustration using simple tools and techniques like Pen Tool, Brush Tool, Layer Style, etc. in Adobe Photoshop. In this tutorial artist will show you how to make a photograph look aged. Here artist will be showing you how to create a background bokeh effect to bring the foreground into sharper focus. Some great effects, thanks for sharing! Oh wow love these effects! I’m going to try them. Thanks for posting! Great tuts in here! Very excited to try some of them out. Thanks for the share. Awesome effects! Love the X-ray effect. This list will become handy for sure. Thanks! Amazing and inspiring. Thanks for posting! Thanks for sharing some great stuff in photoshop!! I like the pics you have shared in this blog. Great work and fabulous designs. Some really great tutorials in this list, thanks ! Some awesome effect! Great collection, thanks! this is some real good stuff.how do i get one of these am into photography,any recommendation. amazing tutorials… I haven’t seen no better. Most people think time is like a river that flows swift and sure in one direction, but I have seen the face of time, and I can tell you – they are wrong. Really nice effects. I like your collection.